Every festival has its foods and decorations. Unfortunately, while mistletoe and wine is great in its place, an upset can mean bad news for your décor. Here are a few tips to help you come through the holidays with your home unscathed. The longer you leave cloth in dye, the more colour leeches across. It’s the same for stains: mop up red wine straight away and even a white marble typically won’t show a shadow. Leave the same spill for an hour or three, and both the acid and dark colours in the wine have time to work on the stone. Typically, a sealed stone kitchen worktop or flour can go up to 24 hours without staining, but there’s no point in taking an unnecessary risk. While stone is incredibly strong, heat-proof and also stain resistant, it can be damaged. Scratches are one of the most common problems, so make sure you hang sharp decorations away from stone tiles, and use pads on the feet of metal furniture, including Christmas tree stands, as these can scratch stone floors. Be careful when moving furniture, and avoid dropping anything heavy on a stone worktop or floor, as a chip or smashed tile can be tricky to replace seamlessly. Once you’ve mopped up the spill, rinse the area with water and wipe with a soft cloth. In many cases, this will be enough to clean the area. If this doesn’t work, progress through gentle soap and then harsher cleaners. Remember that harsh chemicals can dull polish and damage stone, so use a dedicated stone cleaner. Stone is incredibly durable, so most of the time what you’re trying to protect is the polish and/or the seal. Just as stainless steel or glass can be scratched or dulled by scourers, so can a stone polish. If a stain is dried on, remove what you can with a soft implement, like a wood or silicone spatula and soak the rest off. Once you’ve cleaned up the immediate mess, if there’s still noticeable damage, give yourself a day or two to get used to it. Sealed stone is very hard to stain, but if you spend a lot of time cleaning something, it’s easy to get very attuned to the details and obsess about its imperfections. Before reaching for the big guns, take a look in daylight a day or three later, and see if you can still spot the flaw. If it’s still there – perhaps there’s a chip or scratch in the mix, too, or the polish is noticeably dulled – give us a call. There are very few stone floors or kitchen worktops that can’t be rescued. If you love the look of marble worktops but haven’t found something that meets all your criteria, check out our selection of quartz worktops. Quartz worktops are tough as stone, made from over 90% natural quartz and are food safe, easy to clean and hard to damage. That they look great is simply a bonus! 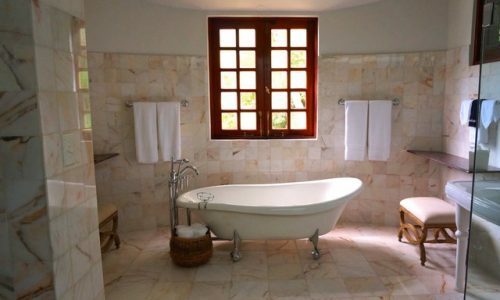 Which is the best stone for a bathroom renovation? Modern engineered stones are available in so many more colours than natural stones. There’s a whole rainbow of shades, in fact, so you can have almost any hue you like for your quartz worktop or new bathroom tiles. We’ve picked a few of our favourites in each colour.